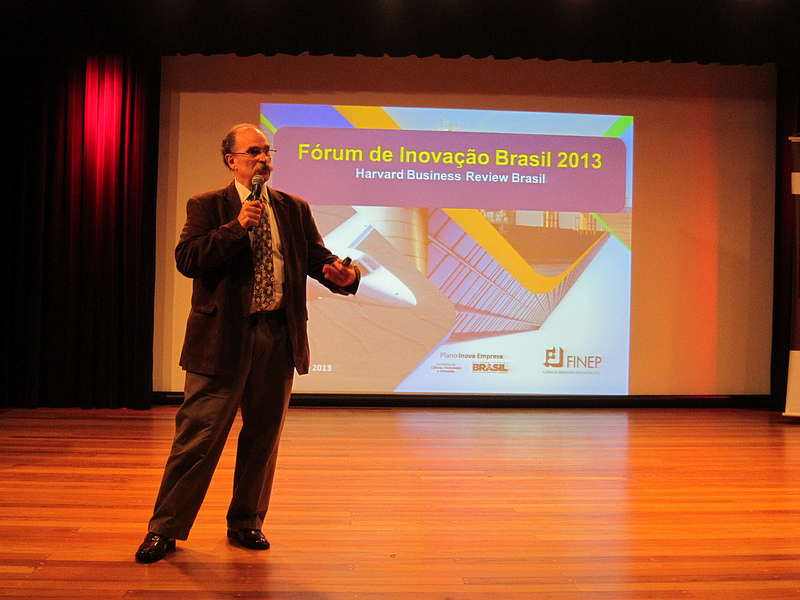 Yesterday I had the honour to be invited to Fórum de Inovação Brasil 2013 (Innovation Forum Brazil, 2013) hosted by Harvard Business Review Brasil in partnership and Insper (Institute for Teaching and Research), and in partnership with FINEP (The Brazilian Agency for Innovation) and the Ministry for Science, Technology and Innovation. 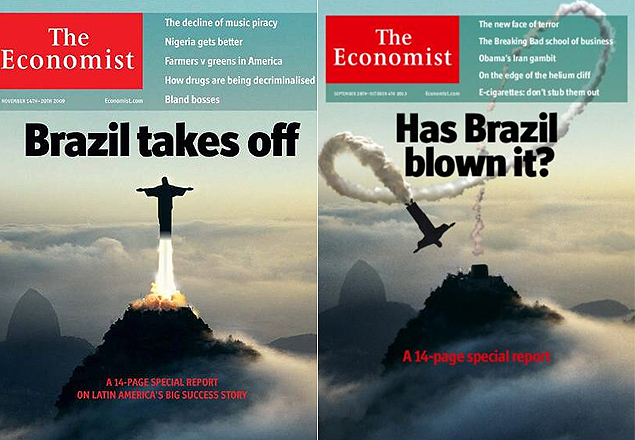 The forum was being held a week after The Economist magazine ran its second in-depth analysis of Brazil, with what for many Brazilian’s was a quite insulting front cover, asking the question “Has Brazil blown it?” In 2009 the magazine placed on its cover the statue of Christ the Redeemer ascending like a rocket from Rio de Janeiro’s Corcovado mountain, but just four years later the same cover now showed the rocked about to crash. Now that I have been coming to Brazil since 2010 and now live and work here, I can really see how superficial articles and reports by the likes of The Economist are, which make no reference to the culture, history and systemic nature of the problems Brazil’s faces. I was in two minds about this particular article of mine as I need to write an in-depth analysis and response to the Economist but that would make this article far too long. One very obvious observation though is that it can be quite lazy journalism just to state what President Dilma Rousseff should do to solve the complex issues. It is simple to state what the problem is, but quite another to provide any meaningful solutions. When you really get to know Brazil, you discover that in fact Brazil has many different governmental agencies, many of which are doing some extremely important work funding some excellent projects with the aim of developing and improving the country. One such agency is FINEP, the Brazilian Agency for Innovation, and Glauco Arbix, the president of FINEP opened the forum yesterday with his own deep reflections about Brazil, innovation and which actions need to be taken to drive Brazil and accelerate Brazil to a level of innovation which can match that of those countries with advanced innovation agendas and support infrastructures. While Brazil continues to struggle with a daunting level of bureaucracy in pretty much all facets of both business and social life, agencies such as FINEP come to play a crucial role in helping businesses simplify processes and also obtain funding for projects. One such project which Glauco discussed was FINEP 30 Dias, a streamlined methodology which has been designed to evaluate innovation projects of businesses seeking funding within a competitive timeframe (30 days). In a previous review of another Harvard Business Review event on leadership, I mentioned how I was unhappy that the two American key note speakers seemed to make no effort in adapting their material or presentations to either a Brazilian audience or Brazilian context (Leadership in Transformation in Complex Environments). The keynote speaker at this innovation forum was also American – Dr. Kenneth Herd, General Manager of GE in Brazil, who is responsible for GE’s move into Brazil which began three years ago. I had the opportunity to speak to Kenneth before his presentation, and also unlike the previous keynote speakers mentioned, Kenneth stayed for the entire event, something which does not always happen, but which for me is extremely important as it allows delegates to be able to initiate important new dialogues. Kenneth has many years of experience at GE, starting in the US when it was still extremely US centric serving a mainly US customer-base. The company itself has an extremely interesting history, being founded by Thomas Edison in 1892. It is the only company remaining from those which were listed on the Dow Jones in 1896, reflecting it’s ability to “respond and adapt” – a key dimension of sustainability. Worldwide GE have 3000 researchers and 40,000 engineers. GE has been active in Brazil for 93 years, starting with GE Lighting in Rio in 1919. Their current turnover in Brazil is $3 billion US, with over 8,000 employees across 18 facilities. Their key sectors are Oil and Gas, Healthcare, Transportation, Aviation, and Energy. They identified Brazil as a key strategic country to expand into, since it is important that they develop new products which suit the needs of local customers. In order to do so, they need to develop strong connections with government departments and universities and other research institutes, something which speeds up the time to market for new products. GE have opened research centres in Munich, Shanghai and Bangalore, and are now in the process of building a new research centre in Rio de Janiero, as part of GE’s global innovation strategy. What made the keynote talk extremely interesting was that not only did Kenneth share his experiences in these international centres, he also focussed on the specific challenges in Brazil and also how a major multinational such as GE views Brazil. For Brazilians, many who often can seem to have quite a negative view of their own country, his views may comes as quite a surprise. Kenneth stated that Brazil had “an outstanding strategy for the support of research and development” via the various agencies and policies. 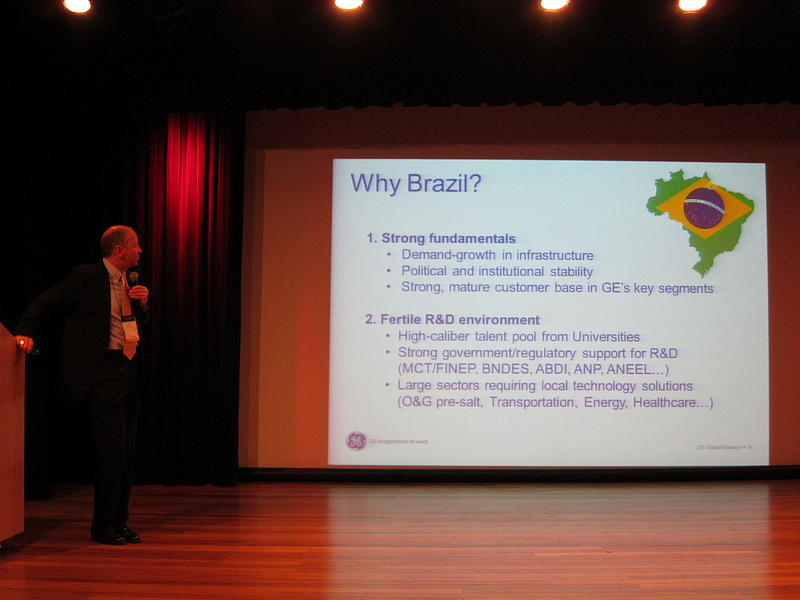 GE had the belief that Brazil has a “forward-looking R&D strategy and environment”. An interesting trend he noted was that many very talented Brazilians are now returning home, perhaps partly due to the economic crisis in other parts of the world. He was “thrilled with the quality of talent in Brazil” but interestingly GE are targeting PhD students with 5 years of experience as opposed to other Brazilian companies which more generally attempting to attract masters students with engineering backgrounds. However, GE see the competition for this talent pool increasing, hence they are also investing in universities, and doing a great deal to reduce attrition, i.e. losing their most talented people to other companies. 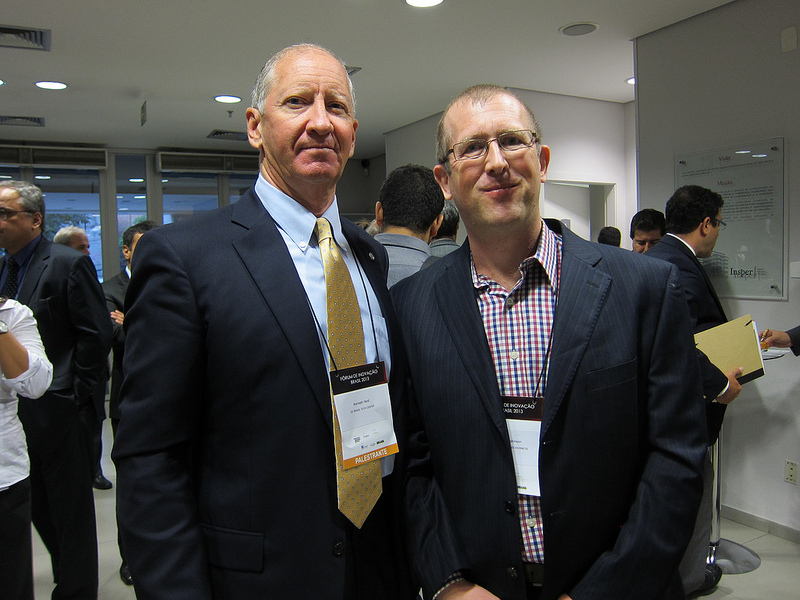 Kenneth is overseeing the development of GE’s new technology research centre in Crotonville, Rio de Janiero. The company plan to expand from 100 to 400 researchers in Brazil, and the centre is due to open next year. It was recently visited by GE’s board of directors. After the visit, the CEO declared that “this will be the most impressive GE research center in the world” which is excellent praise indeed. The challenge though for GE in Brazil is that it is currently in its “in country for country” phase. This means that it is developing new products in a country specifically for customers within that country. Their operations are not yet at that stage where Brazil is a “best-in-class’ exporter, and so there is still much work to be done, not just by GE but by the government and its agencies to help transform the country. If you are interested in this area, you may wish to read another article of mine which looks at the Brazilian Confederation of Industry’s strategic roadmap for Brazil 2013 – 2022. Following the keynote came three in-depth panel sessions; Innovation and the power of Government purchasing, Guarantees for Financial Credit for Innovation and Open Innovation and Technology Platforms. The discussions were wide ranging, and I think in the future it would be really interested to see HBS Brasil and FINEP expand the audience to include representatives from foreign companies and organisations, as the forum is an extremely educational environment for those who wish to learn about Brazilian challenges and complexities, and also for them to share their expertise too, as did my fellow Brit John Biggs from Dow Chemicals, director of R&D of Latin America. 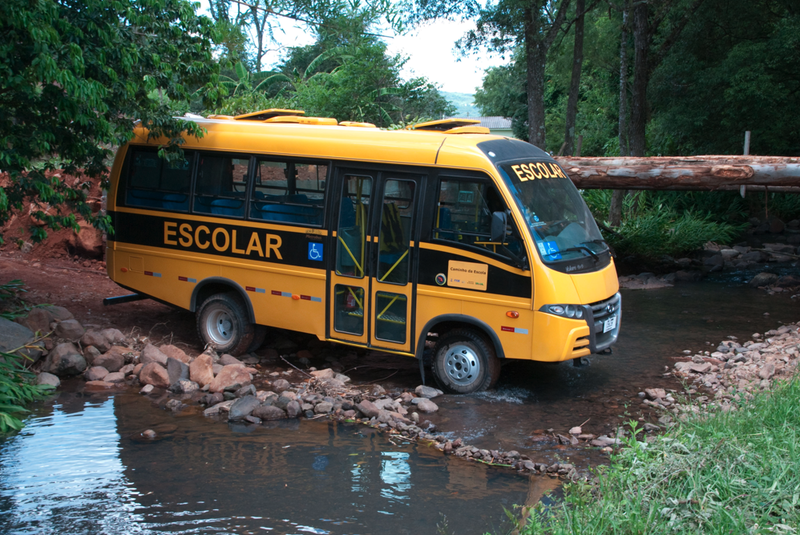 FINEP provide funding for many innovation projects, one of which was the development of 4×4 busses manufactured by Brazilian company MARCOPOLO, discussed by Walter Cruz, Head of Strategy and Corporate Marketing. These busses are vital for the Amazon and Pantanal, a region I was in last week, and having been to both, you can really understand who it can sometimes take children hours each day to get to and return from school. 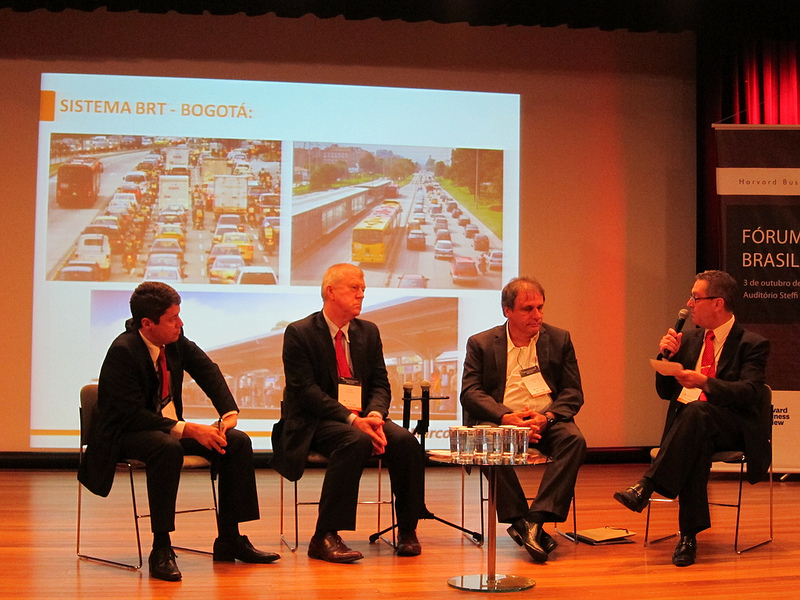 Another project Walter discussed was the smart traffic infrastructure deployed in Bogotá, Columbia, which is used by 3 million people each day. This system was developed in Brazil, at low cost, with a low level of investment and with a short time to implement. This type of system is desperately needed in many cities, including São Paulo, a city which collects R$50 billion in tax revenues each year, and which suffers some of the worst pollution and congestion in the world. The second panel session was quite difficult for me to follow, since much of it was based around a discussion of the technical intricacies of Brazilian finance. This is an important area, but not one in which I myself have expertise. 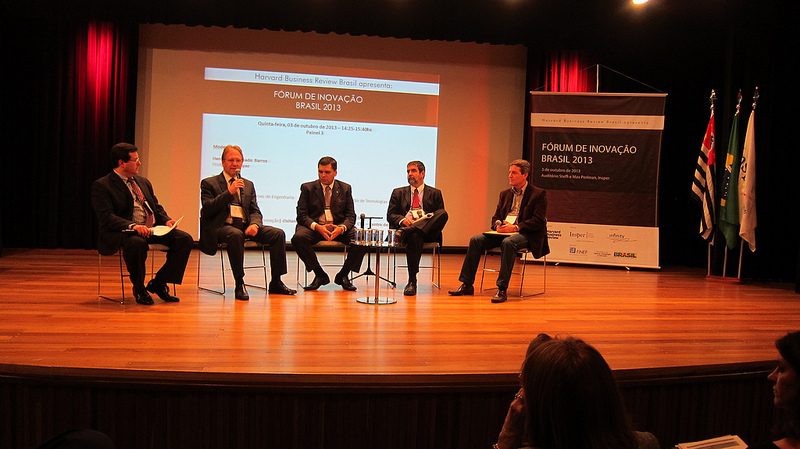 What was interesting to me was a comment made by João Carlos Ferraz, Diretor do BNDES. His observation was that small and medium sized companies are still “invisible” to the system, and this was immediately apparent to me on arrival at the event. FINEP are doing a lot of work to develop a decentralised system so that finance can be made available across the entire country, but they are failing to reach key segments. FINEP still have a focus on major businesses, and these are mainly in commodities and manufacturing. I saw few people at the event from IT and Tech companies, as would be the case at a similar event in the UK, and also it was very much an event for business executives, with no entrepreneurs, coders, hackers, university students, or representatives from new media. FINEP are cognisant of this fact, and as was asked, “these are a growing sector in Brazil but how can they be made visible?” The innovation ecosystem in Brazil could certainly benefit from becoming a little more diversified, something which would help generate buzz, energy and passion that we see at events such as Innotribe, which recently took place in Dubai as an example. Another big area for discussion was based on the contradictory tensions of banks who request guarantees from businesses they make loans to, and the fact that innovation projects by their very nature involve a degree of risk. I discussed this with Maria who was also with me at the event. She has a background in economics and investment banking, and she told me how banks will often take many months to evaluate projects which require even only modest amounts of funding. This is clearly hampering the competitiveness of Brazilian innovation, and in particularly start-ups which need to move a pace which the support infrastructure cannot match. innovation is still a nascent area for Brazil, and as such there is little venture capital funding. After I left Genie Internet and O2, I moved to Digital Bridges, one of the top three mobile internet gaming companies at the time. Part of the finding came from Apax Partners, and their strategy was not only to provide funding, but also place Brian Greasley, who had left O2 some months earlier to join Apax, as the CEO. This type of move is vital for a start-up, since they gain vital industry experience, connections and access to high profile clients. I feel really sorry for Brazilian start-ups, since I see a huge amount of creativity and high energy continually hampered and held back by a crippling legislative and bureaucratic environment. Brazil is certainly making progress though, it is not all bad news, and more enlightened regional governments such as in Rio de Janiero and Florianopolis are working hard to attract both Brazilian and foreign talent by developing the infrastructure such as technology parks which are crucial for the success of the country. As with the first two panel sessions, the final one on Open innovation was equally interesting, and is one of the areas I discuss with business students and businesses in Brazil. The panellist of course noted the many challenges in Brazil, and in the case of Open Innovation, a key challenge is that of the internal culture of an organisation. In Open Innovation projects, an organisation has to move from being closed and only competitive, to being more open, collaborative and co-creative, and partners with different backgrounds and cultures can clash considerably. Like GE, Mauro Kern Junior noted how his own company, Embraer are also developing key partnerships with universities, and that companies now have to develop networks of collaboration. Flávio Cavalcanti from Oxiteno noted how outside of Brazil there were higher levels of knowledge and more efficient ways of working, a point which Paulo Coutinho from Braskem built on by comparing foreign and Brazilian universities. It can take Brazilian universities 15 months to sign an innovation and research partnership agreement, but foreign universities can do so in just one month. 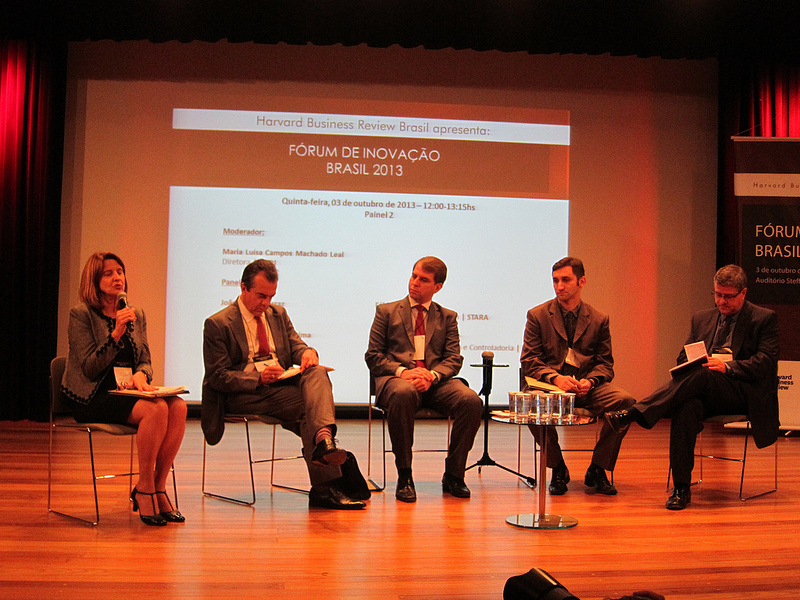 The forum was closed by Glauco, who noted that there is still a dependency in Brazil on commodities. Brazil is a country with phenomenal financial resources theoretically at its disposal. I have not really wanted to discuss corruption in this article, but unfortunately this is one of the major causes for the failure of Brazil to invest in education, infrastructure and technology. Unlike The Economist, I have not wanted to just make wide sweeping statements from high platitudes which are of no help to anyone, and being in Brazil I have really worked hard not to criticise the country, but to come to understand just why it is as it is, and what are the historical and cultural factors which have led Brazil to this point. I am extremely grateful to HBR Brasil and FINEP for my invitation to this forum, and I would also of course like to thank Infinity Conferences who were responsible for the organisation of the event. At this forum people submitted many more questions to the panellists than they were able to answer, and one interesting format for a future event would be to host a world café, which would really be able to capture the entire conversation. This forum attracted a very high calibre audience, who I am sure would be able to contribute just as much as the panellists. All invitations for the event were allocated and there was a long waiting list, showing just how much demand and need there is for something like this. Next week I am a guest of CNI at the second Brazilian forum on Bioeconomics, and they are doing excellent work to develop dialogue right across the board from industrialists, entrepreneurs, investors, academics, researchers, and also commentators and analysts such as myself. I hope that through articles such as this those who may only be exposed to mainly critical articles of Brazil will see that in amongst the chaos and complexities, there are an increasing number of ever more connected centres of excellent, bringing like-minded and optimistic parties together, innovating in an open and collaborative manner, which I hope will soon see major improvements in the lives of those who live here.